WARNING! Stylized and colorful representations of snakes below! 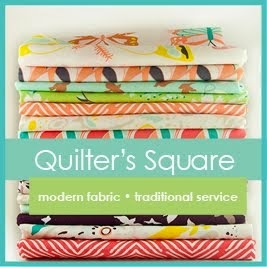 I made a quilt. I call it The Sea of Serpents. Are you afraid of snakes? A lot of people are. One day, I was coming home from a walk and I saw a neighbor at my door. 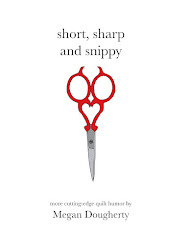 I called out to her, and she turned around and said, breathless, "Oh, Megan! Thank goodness! Is David home?" "Yeah, he's working from home today." "Is he scared of snakes?" Now, I actually have no idea whether David is scared of snakes, but I knew he didn't have time to deal with one, so I told her, "I have no idea but I'm not!" She told me her husband was out of town and a snake had gotten into their finished basement and she couldn't get it to leave. It had crawled up and into a corner between the fireplace and a wall and nothing she did would make it come down. So I said, okay, let's see what we can do. But as we were headed over, my neighbor Sam returned from his run and she saw him. Believing, I suppose, that a man was better equipped to brave the big, bad boa in her den than little old me, she appealed to him for help instead and he, despite being terrified of snakes himself, managed to find some sort of long tong-type things and grab the poor little guy (he was quite small) and toss him out into the backyard. There may have been high-pitched squealing, not by me. Sigh. I really wanted to touch the snake. There are approximately 2600 species of snakes (that we know of) in the world, and about 400 of those are venomous, or about 15% In the United States, we have about 130 snake species, and 21 of them are venomous, 16%, and these are mainly in the groups of rattlesnakes, coral snakes, water moccasins (also known as cottonmouths), and copperheads. It is estimated that roughly 5 people per year in the United States die of snake bite. Five. To work my famous math skills again, that's like a fraction of a fraction of a percent. Now there are somewhere in the range of 1000 to 8000 bites from venomous snakes per year, and that's a slightly bigger percentage of the population, like a bigger fraction of a fraction. (Stop me if all my crazy math is too much.) Even if you get bit, you probably won't die, because anti-venom is readily available. And some people want to kill every snake they see. The thing is, you have a much greater chance of being hit by lightning or of dying from a bee sting than from a snake bite. Snakes, for the most part, (I can't speak for that one copperhead on my parents' deck that one time—he was looking shifty) aren't sitting around going, WHO CAN I KILL TODAY? Well, they are, but only in a what's-for-lunch sort of way, not in a murder-murder-kill sort of way. They're not legless psychopaths. It's very easy to be afraid of every single snake that exists just because a very small number of them will bite you if they think you will do them harm. But we are human. We have consciousness and reason, and we have the capability of ameliorating our own fears through understanding. But most of all, if they are not all out to get us (and they aren't), and if they are not a vital food source for us (you can eat snake, but not many do), then I say, let them live. Better yet, let's learn to appreciate them. They really are quite beautiful. The Sea of Serpents is an appliqué quilt of my own design. 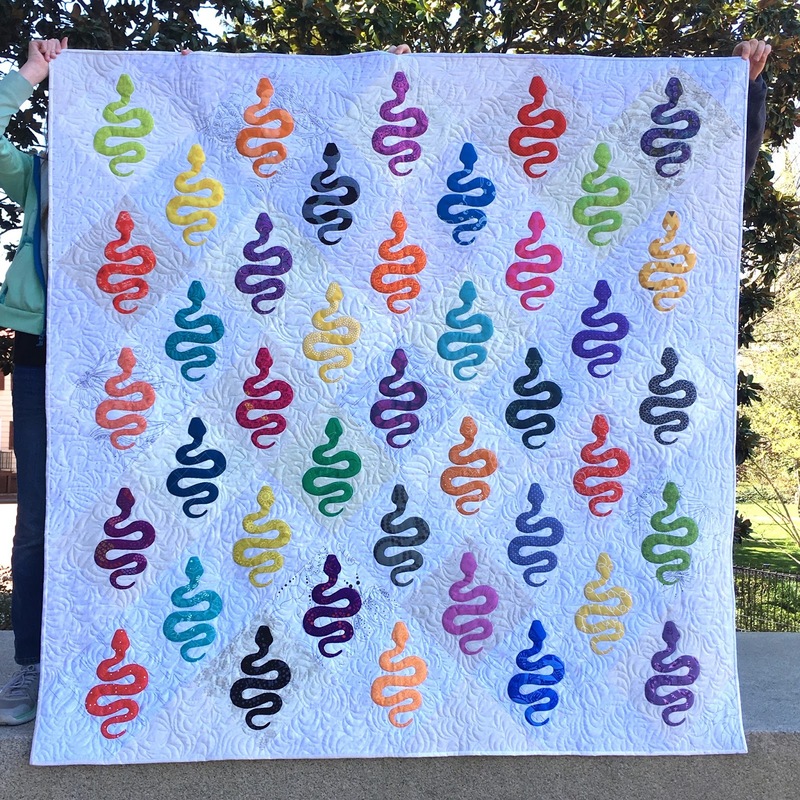 The beautiful longarm quilting was done by Amy Helton, whom you can find on Instagram as @longarmyogigal. I am working on a little story that goes along with it and you may not like it. It's not even remotely funny. But when I am done with it I will link to it.